During your time abroad you will live in central London, close to campus and to the famous Kensington Gardens, Natural History Museum, and West End theater district. Accommodations are in double and triple rooms in University-approved residence halls. Since housing is usually in traditional buildings not originally designed to be dormitories rooms may be smaller than you are accustomed to in the U.S.
Housing upgrade Subject to availability and for an additional fee you may request a single room in the University residence halls. Single rooms are available on a limited basis and must be requested and paid for by the program application deadline. Please contact your Admissions Officer for further details. Ten meals a week (5 breakfasts and 5 dinners) Monday through Friday in the student cafeteria are included, credited on smart cards. Extra meals can be purchased in the University cafeteria, and Kensington has many food establishments where you can purchase food or eat out. AIFS staff will make recommendations on local places to eat, including budget options. For an additional fee, students may choose to add an additional lunch package for Monday through Friday at the University dining hall. The upgrade fee is $650 and students must sign up prior to arrival and may not cancel once they have arrived in London. A special orientation program focuses on the needs of study abroad students. You can meet with your Academic Advisor to design a program of study tailored to your needs. 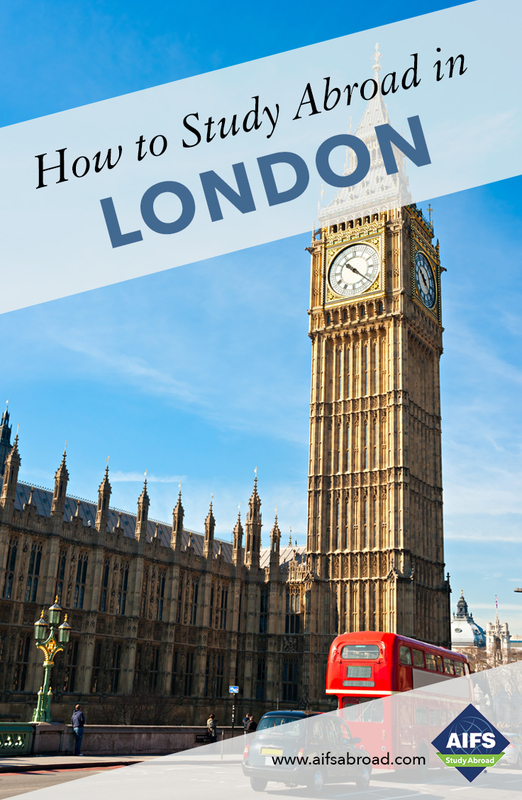 You will be introduced to the practical aspects of living in London such as buying a transportation pass and finding the best bargains. Walking tours of the local neighborhoods and day tours of London are also offered, together with a wealth of social events such as theater visits and a boat trip along the River Thames. You will have a chance to meet your AIFS Resident Director and other members of the University—staff and students—who will welcome you to the community and advise on the multicultural nature of this unique environment. You will also become acquainted with the University libraries and London library system and be introduced to campus social life so you can get involved immediately in the many activities the University and London have to offer. The AIFS Resident Director and University staff help students adjust to life in London and provide a friendly and familiar face. There is an on-call system where students can reach staff 24 hours a day in the event of an emergency and security staff are always on site. The AIFS staff provide help in accessing health care, support for learning/physical disabilities and on-site counseling services. Students can also attend careers service seminars and receive information on U.K. graduate fairs. Student organizations, clubs, and societies are also an integral part of the student activities program at Richmond and allow students to meet others with similar interests. Current active clubs include the Art Exhibition Society, History Society, International Film Society, Model United Nations, Economics Society, Finance Society, The Green Project, The Richmond Psychology Association, The Richmond Gazelle (newspaper), and Community Service Club. Study abroad students are welcome to join these clubs and societies and a place on the Student Government is also open to a study abroad student each semester. With its extensive rail services and five international airports London is the perfect starting point from which to explore the rest of England and the U.K. and the great cities of Europe. Many student travel agencies and low-cost airlines offer inexpensive round-trip flights to mainland Europe. The Richmond Student Affairs Staff will give you advice on where to find the best deals and the orientation program will include an information session with representatives from reputable local travel providers. You can travel on your own, with friends or on one of the many sponsored trips organized by the University. Recent trips have included Iceland, Rome, Copenhagen, Istanbul, Budapest, Prague and Barcelona. See the Richmond University website for up to date offerings. Students wishing to earn academic credit for their volunteer work can take ISL 5000, the 3-credit Service Learning and Active Citizenship course combining a community placement with written work, designed to provide students of all majors with the intellectual, professional and personal skills that will enable them to function well in the community and gain valuable life experience. The Service Learning course is based on the principles of civic engagement, ethical social responsibility and social justice. Please note: Students wishing to do service learning need to obtain a student visa prior to entering the U.K. Please contact your Admissions Officer for further details. Hi! I am originally from Tupelo, Mississippi, but have been living in London since January 2008, and am now very proud to call the city my home! I am excited to welcome students and introduce them to all that London has to offer. I look forward to supporting you throughout your study abroad experience and sharing London&apos;s historic and culturally rich atmosphere over the course of the semester. During university and graduate school, I studied abroad in Madrid and El Puerto de Santa Mariá in Spain, at St John&apos;s College in Oxford, England, and also in London. I have my Master of Arts degree in Higher Education/Student Personnel from the University of Mississippi, and have over eight years of experience working intensively with American students studying abroad in London. I look forward to bringing my experience and passion to my work with AIFS students.